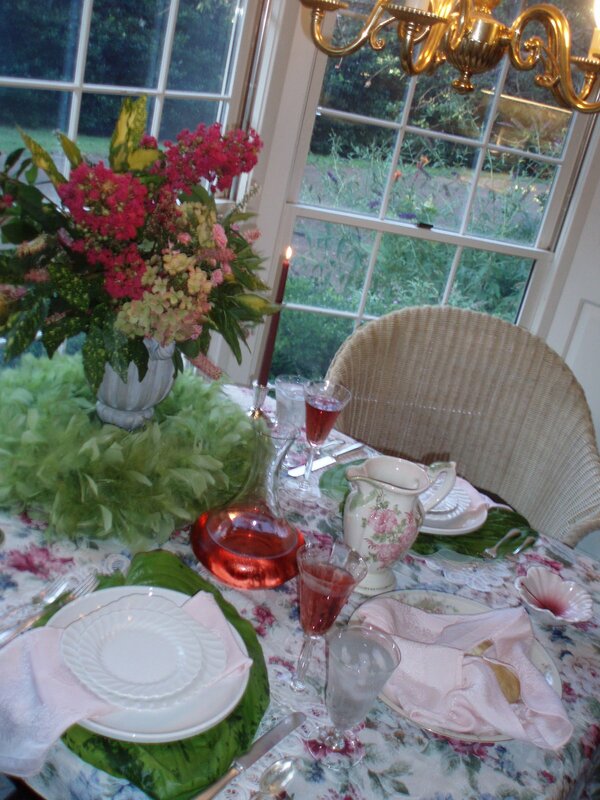 It's time for another Tablescape Thursday with our charming hostess, Susan of Between Naps on the Porch. Susan's the reason I created Affordable Accoutrements and did my first post on June 24, 2009. 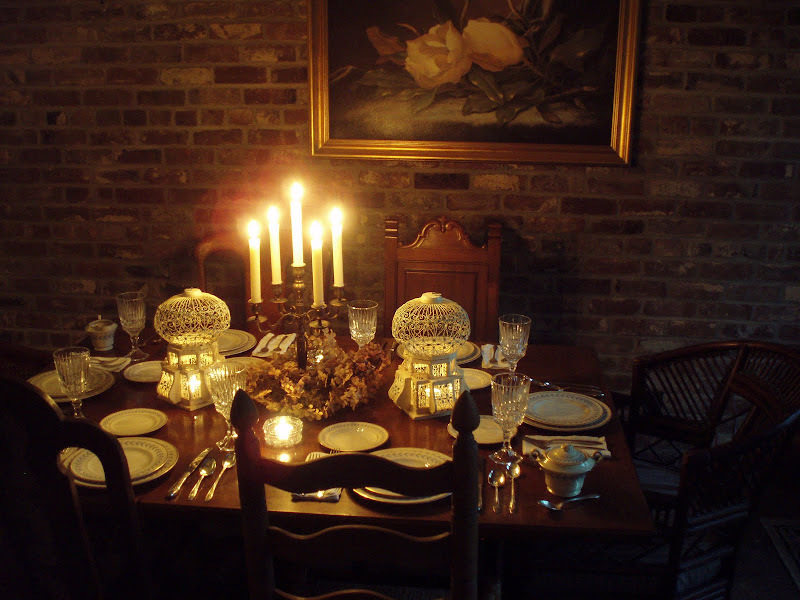 I'd been collecting vintage tabletop items for about three years and decided to do an online search for ideas to use in creative tablesettings. I was both captivated and inspired by Susan's beautiful blog and all her fantastic table settings. I was elated to have discovered the fun of Tablescape Thursdays. Thank you to all of you who have followed Affordable Accoutrements from the beginning (you know who you are!). Welcome to all the visitors and new followers who found me through Blogs of Note. Thank you to the Blogger Team for this unexpected and generous recognition of my humble efforts. I deeply appreciate all the nice comments and e-mails I've received. Even when I don't find time to write and thank you personally, I read them all and take inspiration from your kind words. 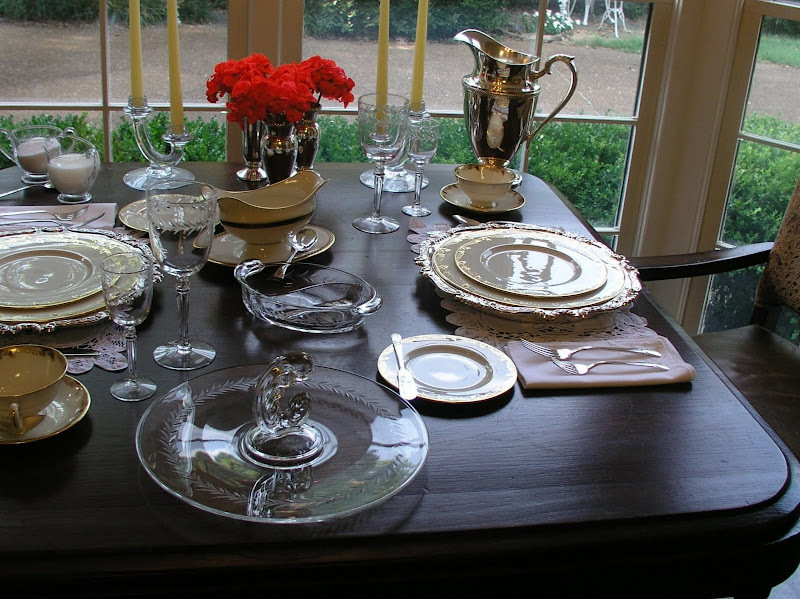 For the new followers (and, OK, because I've been out of town attending a conference and didn't have time to set a new table), I decided to post a look back at the tablescapes I've posted so far. The first is not exactly a table setting ... more of a drink recipe with photograph. It was a warm summer's day, and I decided to mix a cooling mojoto. HERE's the post for the picture below. 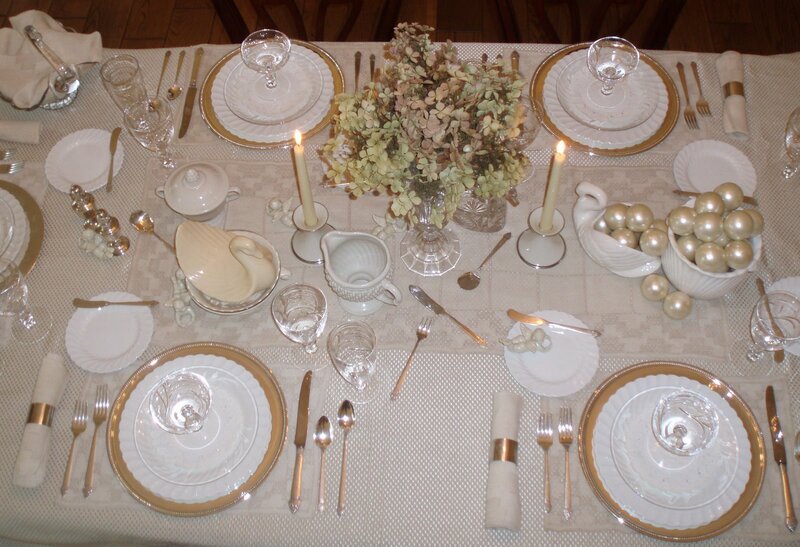 The first full-fledged table setting I did for Affordable Accoutrements was "A Sentimental Setting." Sentimental because it included my late mother's china and flatware. See it HERE. 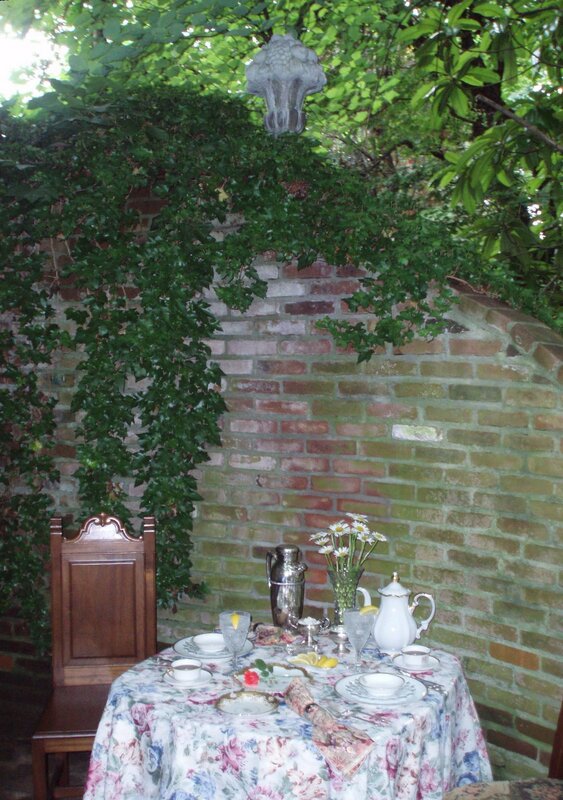 Next came an outdoor setting, "Appetite for Romance?" You can see the other photographs and read about it HERE. I was honored that Fifi Flowers of Fifi Flowers Design was inspired by the image below to create a painting. You can see it HERE. Fifi also has an Etsy store filled with fun, colorful, and affordable artwork. Among the items for sale is a set of notecards, Tablescape Collection II. I was excited to see my table among the designs she's included. Check it out HERE. Next came "Christmas? In July???" See it HERE. "My FIRST Pink Post!" is HERE. Pink Saturdays are hosted every week by Beverly of How Sweet the Sound. If you haven't visited and/or participated, you really should. Always great fun! Here's a "table" for two I set on the bar. See it HERE. HERE is "Mrs. Rivard's Christmas." It includes a (very) short work of fiction inspired by this table for one. In August, I posted "Beige! The New Black?" HERE. "Family Dinner Table" is HERE. 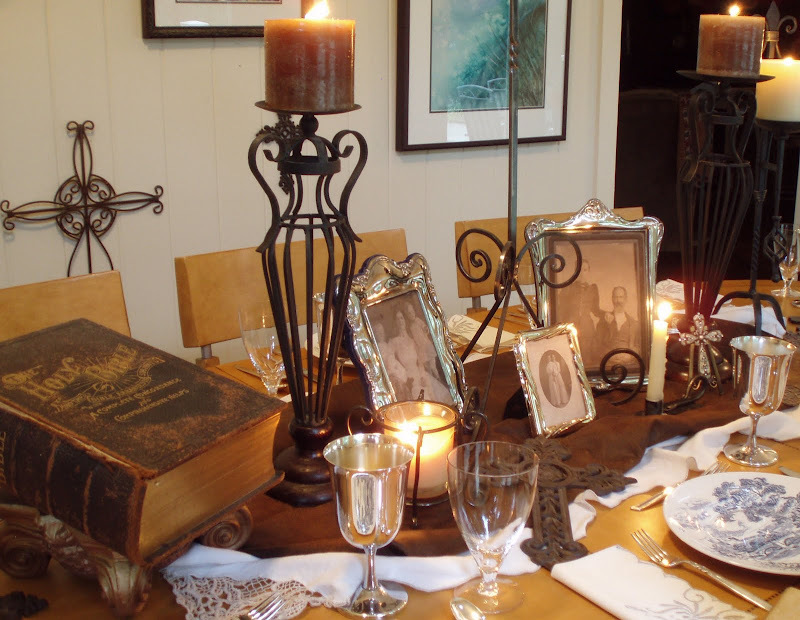 It featured photographs of my ancestors, the family Bible, and iron candleholders made by my brother using our grandfather's old blacksmithing tools. As I mention in the post, the Bible only remained on the table long enough to take photographs. I would never actually put it as risk by having it where food and drink were being served. And the photographs weren't originals. I printed them on cardstock (and didn't use glass, so I wouldn't have to deal with reflections). 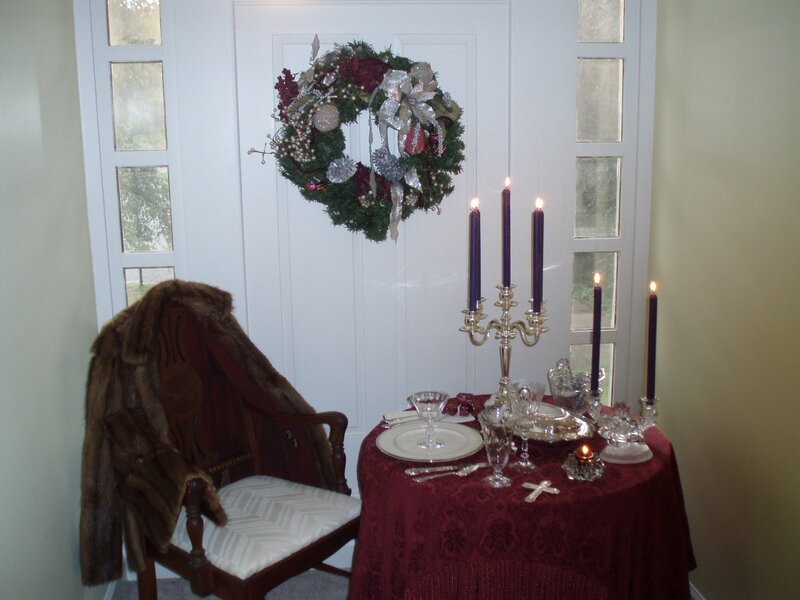 I used items from my vintage aluminum collection for "A Subtle Shine" HERE. For "Party of 14? Right This Way!" I set three tables (what was I thinking?) using Lenox Essex Maroon china and vintage Holly crystal by Fostoria. The post is HERE. I bought a large set of Essex online. It wasn't exactly a smooth transaction. Well, there were casualties ... in shipping. Read about it HERE. Carol of Serendipity had four extra cups from the Essex china she selected as a bride. She was kind enough to send them to me as a gift. Thank you, Carol. It was a lovely and generous gesture of friendship. If you've ever wondered how Lenox makes bone china, click HERE to watch a short video at howstuffworks.com. HERE is "To Match or Not to Match?" 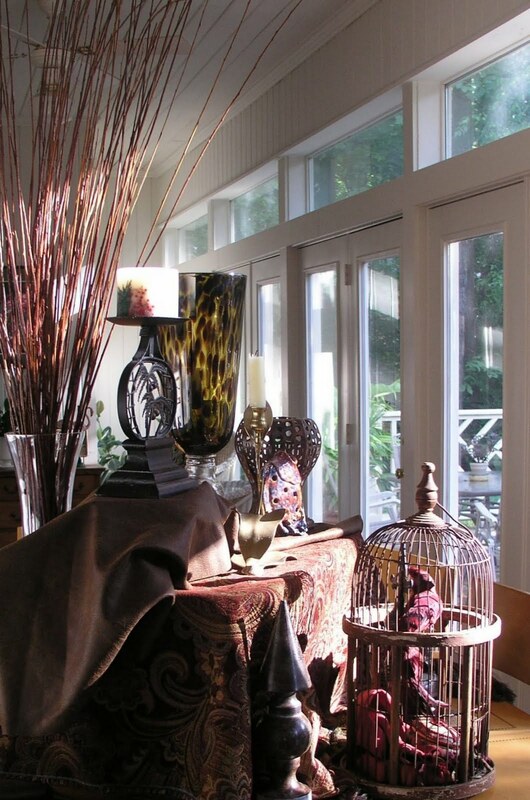 The table features mismatched gold-rimmed crystal I've collected over time. HERE's a table featuring a bird cage (and no dishes), "Bird in an Un-Gilded Cage." The post was included in a fun event, a cloche party hosted by my friend, Marty of A Stroll Through Life. The table below is from "1930's Dinner Party." See it HERE. I included items that might have been wedding gifts for a happy young couple in the '30s. Next came "Dinner Party, circa 1961!" HERE, featuring mid-century modern designs. It was inspired by the Mad Men television series. I took readers to the basement for "A Vision in a Dream. A Fragment" HERE. 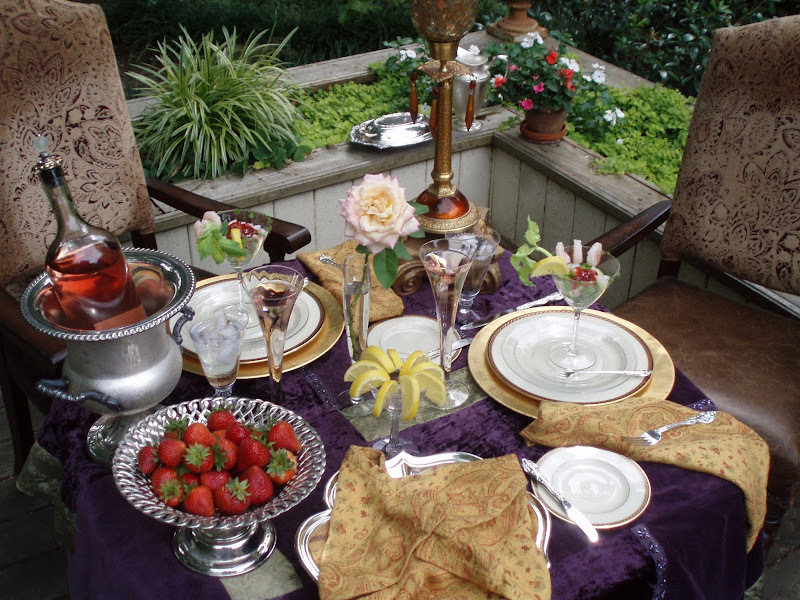 And set a shimmering table for "All That Glitters" HERE. HERE is "Tis the Last Rose of Summer." It featured etched crystal ("Mayfair" by Morgantown), dried roses, and a classic poem. Last week's table was "Golden Foliage" HERE, featuring Libbey water glasses my mother acquired with trading stamps when I was a child. I hope you've enjoyed this look back over my first five months of blogging. 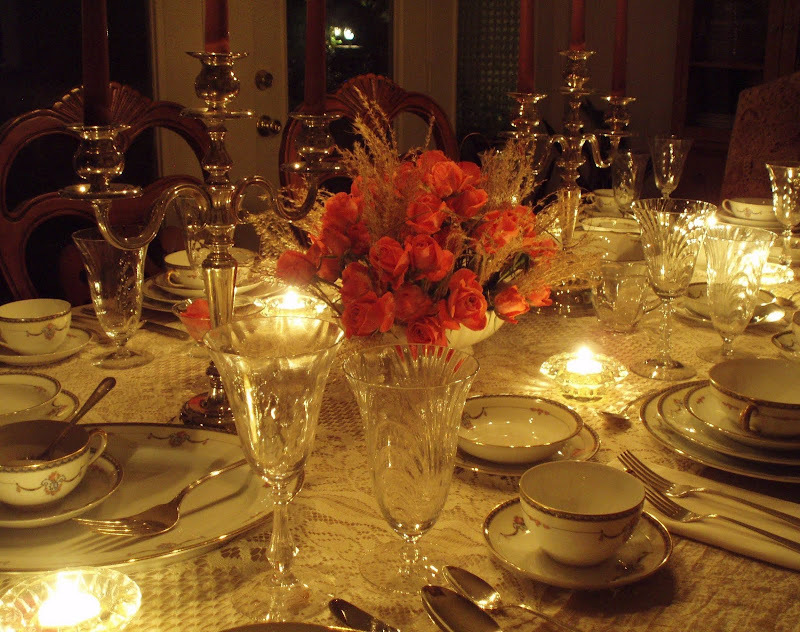 A few of the table settings were actually used for dinner parties, but most were just for fun. It WAS fun ... and good practice in combining various items from my tabletop collections in different ways. Most of what I've shown you came from estate sales (one of my favorite weekend activities!). Ebay's great for completing partial collections, and you can find fantastic deals in thrift stores and antique malls. Research what you like, shop carefully, and respectfully negotiate for the best deals possible. 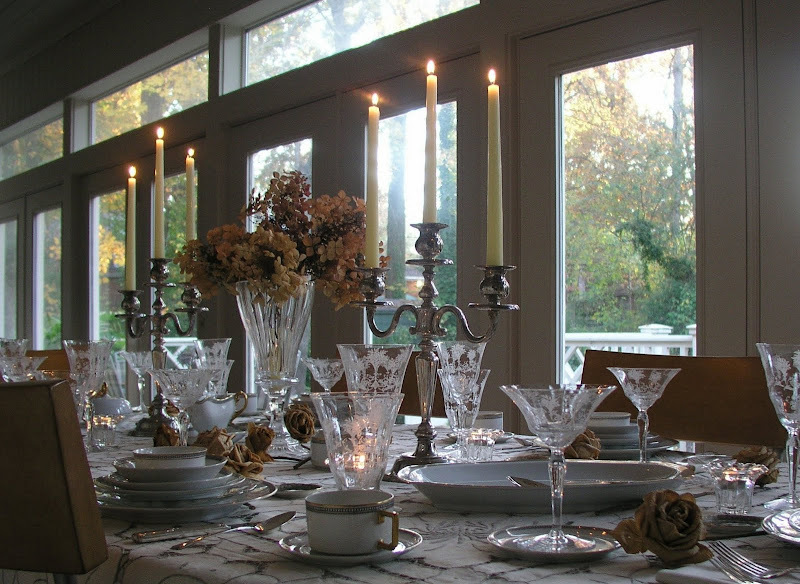 Setting attractive tables doesn't have to cost a lot of money. It just takes time, patience, and a dash of creativity. Oh Bill....I am SO glad you've reposted these beautiful tables! Many of them are brand new to me & are so full of inspiration. 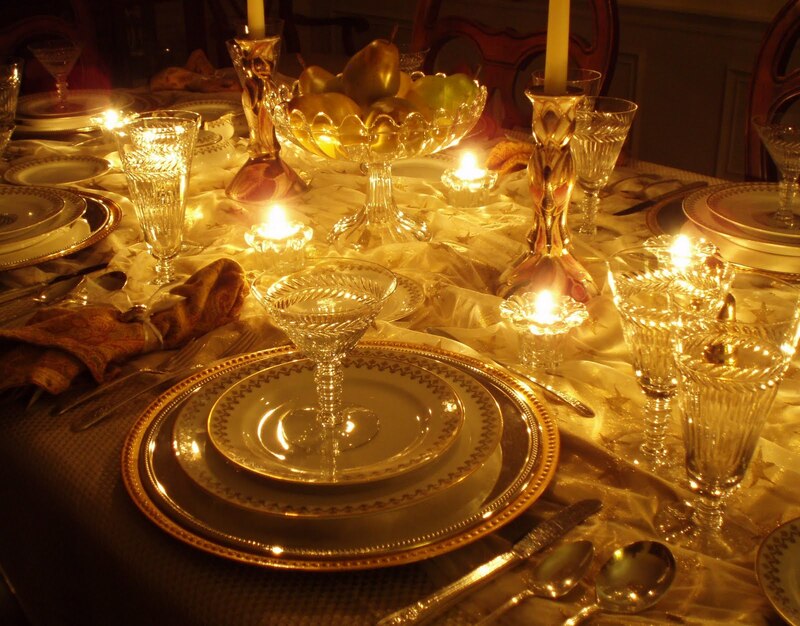 Thank you for taking the time to put links in, too, so that we can go back to read all the luscious details on these scrumptious tablescapes. I can see I'm going to need a second cup of tea this morning to go with the next hour of reading. Bill_Congratulations on the Blogs of Note! You know I have been keeping up with your beautiful tables from day one and I look forward to many more. Hope you and yours have a happy Thanksgiving full of good food and many blessings! Hi Bill, that was a lovely reminder of all your beautiful settings. Also it is very kind the way you have incorporated other blogs. How kind of Carol at Serendipity to send you the glasses, she sure is a lovely lady! !To have your tablescape as a painting, WOW, although very well deserved. I was going to buy some of the notecards, but the postage to the UK is almost as much as the cards. I might not post on Thursday Tablescapes very often, but I love looking at them all. I also like to see peoples houses, furniture etc... I am nosey!! 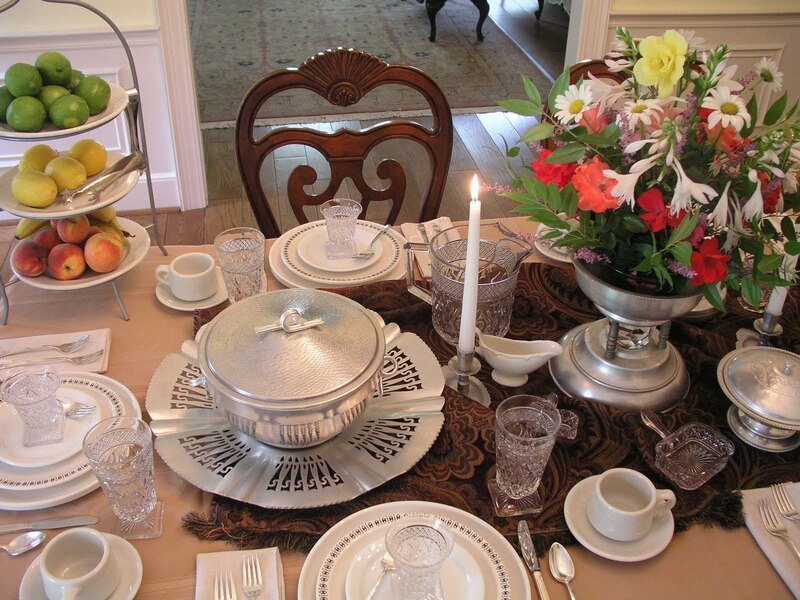 I have to tell you every time I have came to read your Table setting it felt like coming home. They are always special, so warm and comfortable. 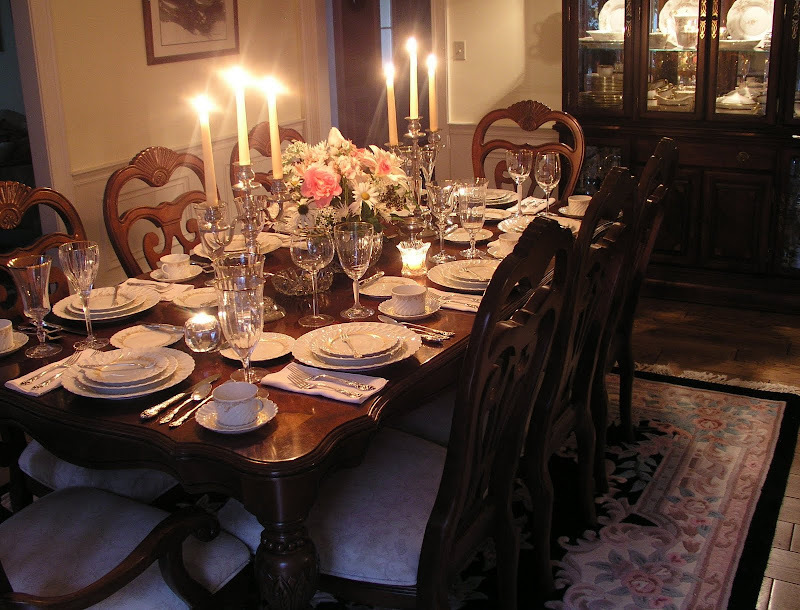 It is the kind of table that you want to sit down to and have a great meal with great friends. Over the last five months I have so enjoyed and been inspired by each of your settings, but I will always have special liking to Mrs. Rivard's Christmas. It was so engenius and I loved the little short story that you added. I think she should make special appearances at several of your table settings, every now and then. You brought her into our lives Bill, now keep her moving around. Ah, the mojito! 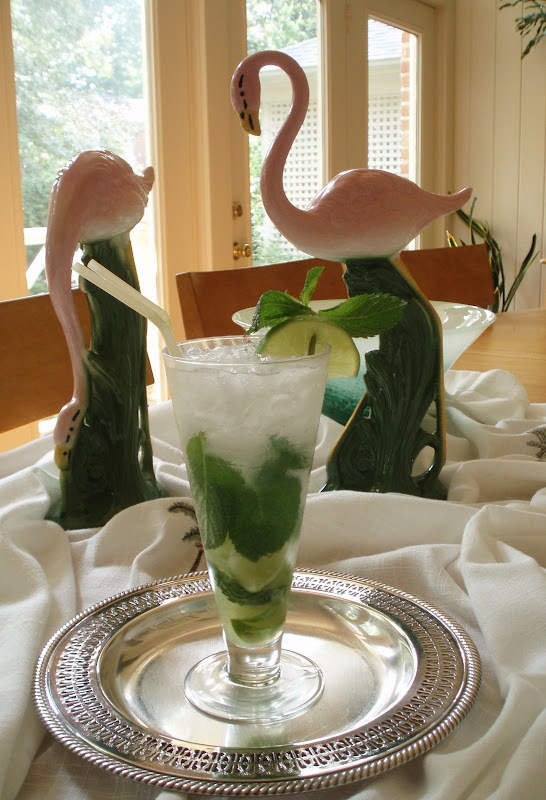 Do you know ever since we found your recipe my husband and I enjoy 'Bill's Mojito' every weekend?! And everyone who tries it says it is the best! And, a 'dash' of creativity? I'd say you have a little more than a dash of creative talent! Each tablescape is so beautiful, it's hard to pick a favorite! I started reading you at 'Morning Coffee On The Terrace' (and I may have missed one or two while we were away) so it was nice that you posted all your creations. All your post are artful and gracefully done. Your lovely table creations have been wonderful to view. I'm so glad you share these with us to enjoy, admire, and get ideas to use in our own lives and homes. Being one of your newest recruits due to your wonderful "Blog of Note" honor last week, I wanted to ask a question that I fear may be something you've covered in a past post. Perhaps, with all your new followers, this may be something they missed and ponder as well. "Where and how do you store all your tabletop items when they are not being used?" This question is especially on my mind with the holidays coming and so many season-specific items being pulled out at this time of year. Love all that you do!! Thanks for sharing! Well Bill, in five months you have built up a huge following. Why is that? Is it because you are so friendly? Is it because you have a great flair for decorating? Is it because you have so many beautiful pieces? Is it because of your fun attitude? The answer is YES of course. Yes to all of these things. I have yet to see something on here that I didn't just love. Keep it up. How beautiful your settings are! Oh my goodness, how I wish I could dine at one of them every night forever! But, I have four young children so I will have to be more creative. But, wouldn't it be wonderful to actually "set" a table for them! Imagine the memories! Maybe once a week? Thanks for the inspiration! I have only seen your Mad Men inspired table setting, which I loved, so I feel lucky that you posted bits and pieces of your first 5 months of tablescaping with Susan. Each is as beautiful as the one before it. You found a great forum in which to display all of your tabletop items because, speaking for all the ladies...we never get tired of excellent taste. You are extremely talented in what you do! You have such an eye for beauty and detail in every part of this art. 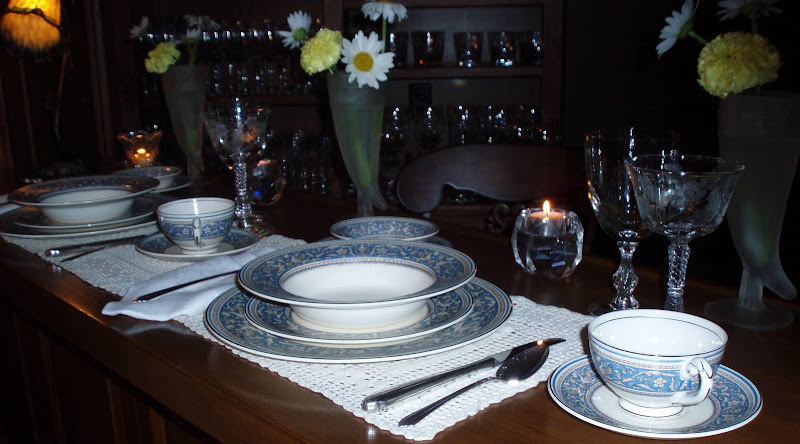 I am impressed and amazed at all the tablescapes you've created....simply gorgeous. I loved this post because of the summary of what you've done is so stunning to see all together. Hello Dear Bill and congratulations on your lovely blog being noticed! I'm so glad you found Susan's blog and entered into Blogland! You have been an inspiration to me the very first time you posted! Some folks really have the knack and you certainly do. I have enjoyed seeing your beautiful tables again. Bill, thank you for posting these tablescapes. I'm having a grand time visiting the various links as well. Great job! Some are new to me, but for those that aren't it's a pleasure to revisit. I often do that anyway. A trip down memory lane so soon ;o) Seriously, it was a trip well worth taking. Keep up the good work. I am so proud of you, Bill! BRAVO! And I've enjoyed all of your tablescapes. I didn't find you until the basement setting with the cages, so this was a treat for me to see your others that came before. I think there is a book here...seriously. You have such a great eye and style, each table is so impressive. Loved it! Thank you so much so showing each of the tables again.I have been following you every week. Keep all that wonderful inspiration coming. Congratulations! I did not know you were on Blogs of Note! I enjoyed seeing all the tablescapes the second time. 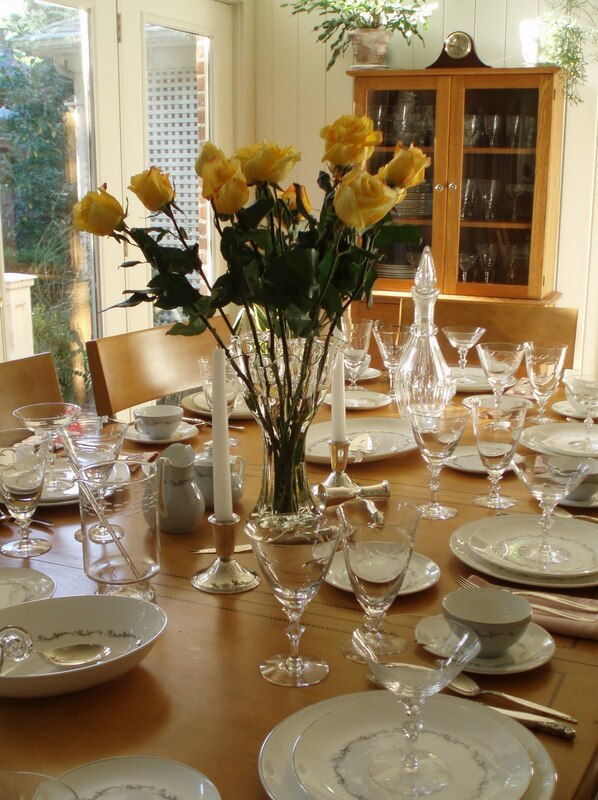 I love those beautiful decoration especially the "Family Dinner Table", that's what we call heaven on house. Can somebody tell me where to buy the cross? Thanks for the trip down memory lane. I actually caught one or two I had missed. My all time favorite crystal from your vast collection is the etched Mayfair. It is truly spectacular! Here's to many years of happy tablescaping. 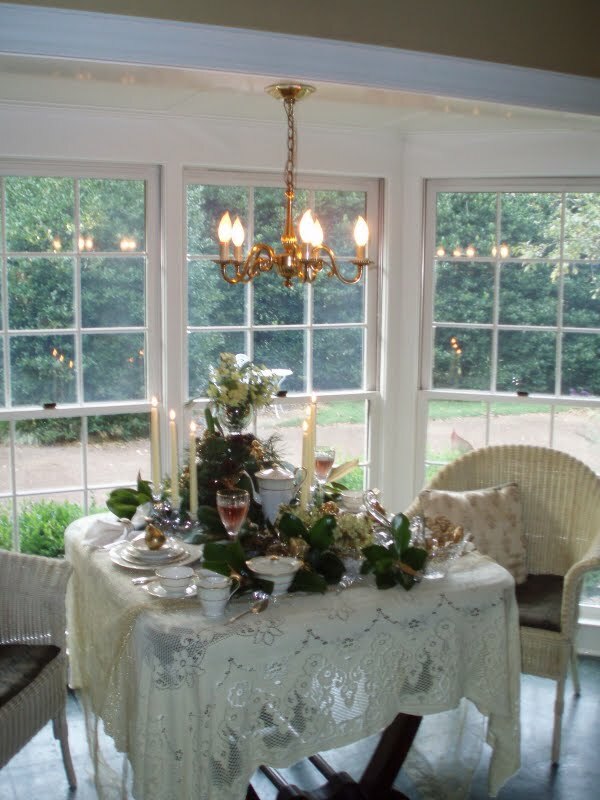 Can't wait to see your Christmas tablescapes! What a great recap of the beautiful settings you've shared with us. I can't believe I missed so many. I love all of them. You are a great inspiration. I have enjoyed every single one of those posts, and did so AGAIN!! Thanks for sharing, have a great week. Bill, thank you for posting these beautiful settings. I have only been blogging for 2 months and I would not have seen these fabulous and very diverse settings. You have such a gift! I am excited to see what you will do for Christmas! I have become such a fan! After the last tablescape that you did, I went back to all of your other tables to see how they changed and progressed. You are the reason that I have started to say yes to buying vintage dishes again. It really made me happy to see all of these tables. Please keep it going..between the oohs and aahs, I get such good ideas from you. These are amazing Bill, each and every single one. We are a rare breed, we lovers of tablesettings. 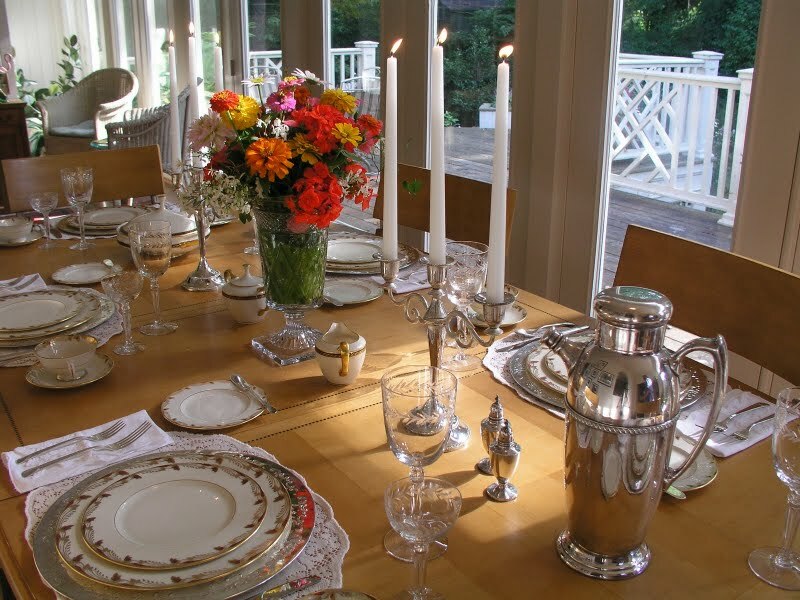 Happy tablescape thursday and boy I do look forward to seeing you Thanksgiving table. I'm so glad that we got to see these again! You do set a stunning table sir! Welcome back! What a great surprise to see you were blog of note huh? I was thrilled for you. I love all of these. My favorite is Mrs. Rivards Christmas. It's like you want to just keep staring at that picture because you know she's coming back any minute. I love it! Thank you for reposting these. I am new to blogs and missed most of them. So lovely and all are inviting. You are so talented. It was so enjoyable to see all of these again. My favorite is the basement one--I guess because it is just so downright cozy! Thanks for the trip down Tablescape Lane. Such an inspiration! Congratulations, Bill, for being recognized as a Blog of Note. You truly have a flare for design and decoration. I have followed you from day one...in fact, I think my first tablescape was on the same day as yours. Out of all the tables you have designed, my favorite was the basement...so warm and cozy. But...I am still waiting for the ending (or at least the continuation) of Mrs. Rivard's Christmas story. That was a WONDERFUL post. Oh, forgot to say...CONGRATS on the Blog of Note! Awesome and So Deserved! As a new follower I am so glad you posted all of these beautiful tables. You have the most amazing collection of beautiful things I have ever seen. I look forward to seeing more of your stunning tables in the future. As always you amaze me with your talent for decoration. Great job ! Bill, good taste and you did it. Congratulations! Thanks for giving me the opportunity to view the few previous tablescapes that I missed the first time around. I even enjoyed looking at a couple of the posts that I had already seen. Again... I always appreciate how you share the history of your treasures! Congratulations on Blogs of Note, Bill! Back Porch Musings was selected just about a year ago. I consider it to be a wonderful honor. You and Affordable Accoutrements deserve this honor in so many ways. 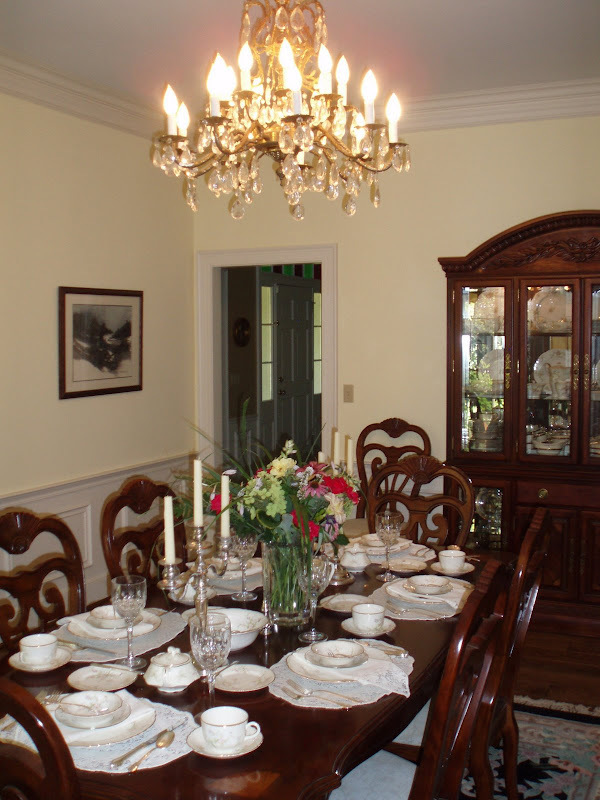 Your table settings are stunning, your writing style fabulous and the history you share is priceless! 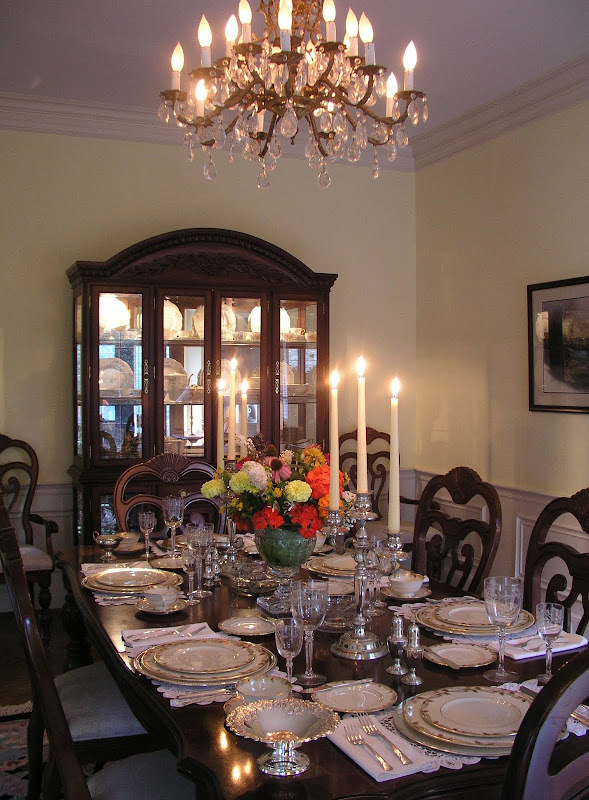 Fantastic Tour of Bill's Tablescape!!! Beautiful work!! You do deserve the recognition that is wonderful news hon!!! Love the table tops and the photos...how beautiful and creative...bravo! Thanks for that look at the past with you. You certainly have posted some beautiful and varied tables for us. I think you are one of the most creative tablescapers out there! Keep posting and teaching us. Have a wonderful Thanksgiving! Great run down of all your tablescapes and fun to see! Oh, I enjoyed seeing all these again! Don't think I can choose a favorite, they are all special! I did enjoy the Mrs.Rivard's Christmas story! Of course, the one with the yellow roses stole my heart as well! I still think you should publish all of these for us to have a copy! How nice to have a review of all your wonderful 'scapes! So much beauty to take in! That mojito in the first pic looks so refreshing and takes me back to summer! Stumbled across your comment on Brenda's Cozy Little House. Even a casual girl like me appreciates these beautiful settings. You're so lucky to have such wonderful light. What fun to look back at all the creative playing with dishes! Lovely things -- someday you must show us where you store everything when it is not mugging for the camera. The Liberty Glasses brought back so many memories for me - I used to go with my mom to the S&H Stamp store with her books of stamps and we had those glasses (which she had kept them). Thanks for posting all your past tablescapes as I just started blogging and missed them. So many great ideas! I love the shimmering one most. Thanks for the inspiration! Bill, What a wonderful journey thru your early tablescapes. Each and everyone so beautiful, but of course I would love the outdoor one with the purple cloth. I certainly enjoyed the trip and thank you for showing them. Your table settings are beautiful and elegant. You really have a gift! Oh Bill, so many items to comment on going back on a tour of your posts. LOVE it that you have incorporated vintage aluminum ware into your tabletops. There is so much of it out there, and it is very affordable. It is, however, sometime difficult to find it in great condition, but it does add a subtle shine to a table. And then those gorgeous vintage beverage glasses with the leaf motifs. They are incredible. I'm always amazed when I go back to Kansas City the number of vintage glasses in those caddies that are still around and very affordable. Hi Bill,thanks for the trip down memory lane. I honestly can't pick a favorite theme because they are all lovely. Have you thought of doing a book on tablescaping and your adventures in thrifting? I'm quite serious! I totally remember the pattern you featured in your last post. I'm sure we had it as well but they are all gone now. Hey, you were a blog of note? Congratulations! Another reason to seriously consider that book. Hi Bill! Just wanted to let you know that we started our weekly "Fancy Fridays" last week. We don't have much, but I hope to start collecting more. I did set out all our matching dinnerware, and we had candles! The younger kids were so excited! The boys used their best manners and were so proud! The next night, while eating out, my oldest boy whispered to me to look because he wasn't resting his elbows on the table. So funny, and wonderful! Thanks again for the inspiration! A Cactus on the Table??? And a Giveaway! Estate Sale, the Music Video?? ?